We are often faced with non-stationary data like those shown below. The signal is the forwards and backwards motion of a ship at berth (surging) under different mooring arrangements. It is non-stationary because if we take any window of data and calculate its variance (standard deviation squared), the variance will differ depending upon the window we choose. Dealing with such records is problematical because the traditional methods, such as Fourier analysis, simply are not applicable. However, there is a new method that is analogous to Fourier analysis that has been developed precisely for this problem. It is orthogonal wavelet analysis. 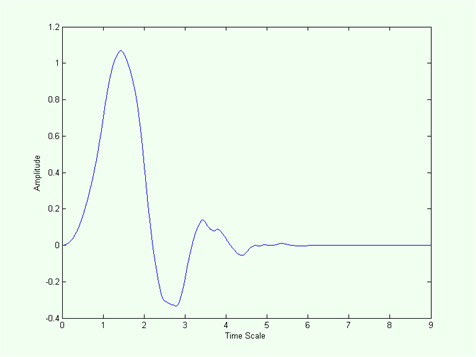 In this webpage, I will explain how the method can be applied to extract useful information from the signal shown below. Hubbard, B. B. 1996: The World According to Wavelets: the story of a mathematical technique in the making. A. K. Peters, 264pp. Very briefly, whereas in Fourier analysis we take a signal and fit sines and cosines to it to generate a set of coefficients, in wavelet analysis we fit a basis function called a mother wavelet, as shown below. A mother wavelet is quite different to a sine or cosine in one particular way: it has a finite start and finish, whereas sines and cosines are infinite. In mathematical terms, we say that the mother wavelet has "compact support". The importance of having compact support is that when you fit it to the signal, you get a localised rather than a global result. So, instead of getting a single coefficient for each sine and cosine as in Fourier analysis, you get a series of coefficients that vary with time. Thus, the wavelet decomposition can accommodate local changes to the signal. There are hundreds of mother wavelets available. The Daubechies series (after Ingrid Daubechies, a pioneer in the field) goes from 1 to 20. Daubechies No 1 (called db1 or Haar) is simply a square wave, whereas Daubechies No 20 (db20) has about the same shape as db5, but with many more oscillations in the tail. The question of which mother wavelet to use is one that perplexes beginners, but with experience you find it makes little difference. Indeed, I use db5 for almost everything. The way the decomposition works is shown to the left. We start with the original signal and fit the mother wavelet to it at the smallest scale. This produces what is called the first wavelet "detail" and a remainder called the "approximation". Then we double the timescale of the mother wavelet (called dilation) and fit that to the first approximation. This produces a second wavelet detail and the remainder is the second approximation. And so the process continues until the mother wavelet has been dilated to such an extent that it covers the entire range of the signal. The result is a set of details, each corresponding to an average timescale that doubles at each level, and an approximation. 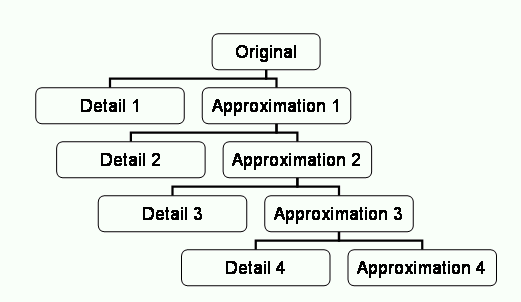 The details have a special property called orthogonality, which means that they are completely independent of each other and therefore can be added together in any sequence. Furthermore, the variances can be added together to obtain the variance of the original signal. The easiest way to explain how orthogonal wavelet decomposition works is by example. 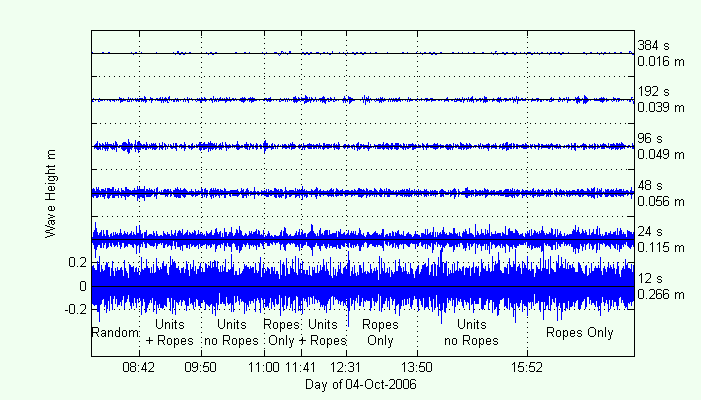 The ship motion signal shown earlier consists of 36,107 data at 1 s intervals. Using the Daubechies No 5 mother wavelet shown above, we can decompose the signal into 11 levels, giving 11 details and the approximation. The details have timescales of 3, 6, 12, 24, 48, 96, 192, 384, 768, 1536, and 3072 s. If we take the sum of these 11 details and the approximation, we will obtain the original signal. First, let us compare the original signal with the final approximation. This is the remainder after the 11 wavelet details with timescales ranging from 3 to 3072 s have been extracted. You can see that the approximation is in effect a mean line through the data. Indeed, if you were asked to represent the shape of the signal by drawing a curve through it by hand, the approximation is pretty much what you would draw. And this is what we get if we sum up all 11 wavelet details. It contains timescales from 3 to 3072 s. The mean of this signal is zero. In some cases, the above plot may be satisfactory as a final product, but in this example, we are interested in ship motions with timescales between 12 and 192 s (details 3 to 8), corresponding to the swell and infra gravity waves in the harbour. The figure below shows just these wavelet details with the corresponding timescale to the right of each curve. 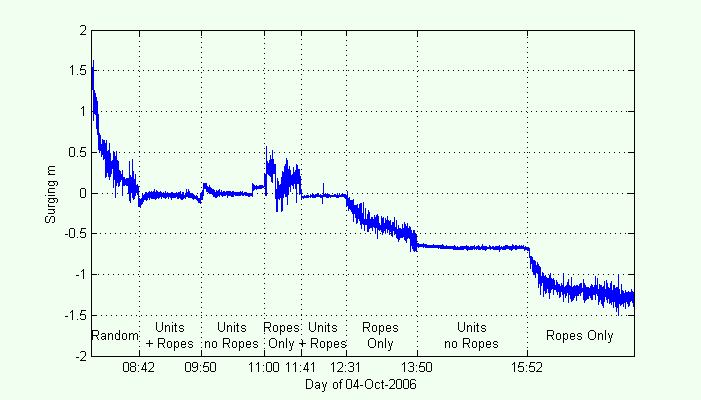 We see that the wavelet decomposition has provided information that was not obvious from other plots, namely that at 12 s timescales, there is no difference between the different mooring configurations, but for longer periods, the mooring units effectively attenuate the motion, whereas ropes do not. In this webpage, I have illustrated the use of orthogonal wavelet decomposition by application to a practical problem involving the surging of a moored vessel at her berth under different mooring regimes. Orthogonal wavelet decomposition is useful when your signal is non-stationary, meaning that its variance depends on the window of data under consideration. 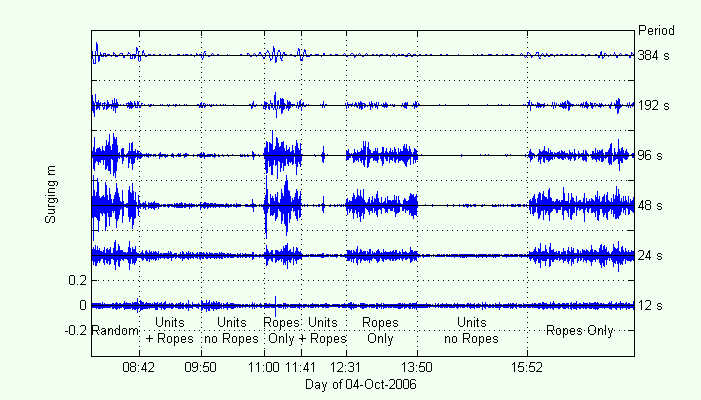 The method is not particularly useful for stationary signals like that below, which shows the equivalent wave record for the ship motion shown above (the labels to the right include the timescale as well as the significant wave height). In this case, traditional Fourier spectral methods would be adequate. 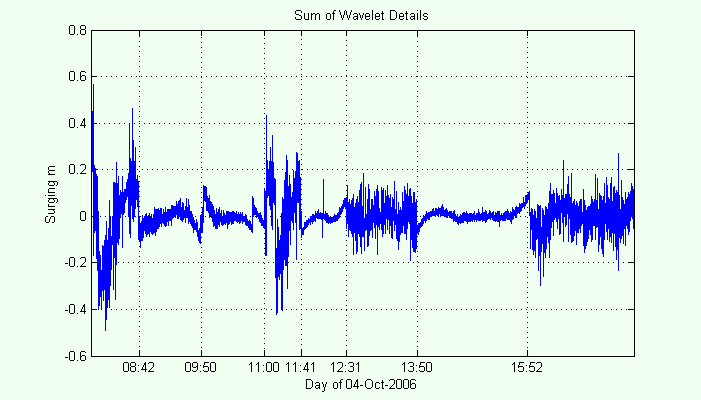 However, if there was variability in the waves throughout the day (as sometimes occurs at this site), orthogonal wavelet decomposition would provide information on the variability of wave height at the various timescales with time.